While the explanations presented in the previous section can help you wrap your head around what a lease can offer and the obligations that it imposes, it is also important to understand how a lease functions from a legal and contractual standpoint as well. This will not only help you understand what the roles of the different people and organizations that you will interact with in the leasing process are, but also help you understand what kind of negotiation leverage you have and the kind of pitfalls you need to avoid when getting a lease. This section of the guide will also highlight how a lease is different from similar agreements such as a long-term car rental or financing. One of the more confusing aspects of a lease is the ownership of the car and the related responsibilities. Unlike a regular car loan, the organization that is providing the money to purchase the car is also the legal owner of the car while it is under lease to you. You - the lessee - are the person that is named as an authorized operator of the vehicle. That means that the vehicle will be registered in the name of the leasing company, and it is the entity that is billed for various legal expenses relating to the car, including local property taxes, parking violation tickets and the like. However, you as the authorized operator of the vehicle, are responsible for paying those costs as part of your leasing agreement. As part of the leasing agreement, you are also responsible for maintenance and keeping the car in good shape, and will be billed by the leasing company if the car requires any significant repairs or restoration work when you return it at the end of the lease. In short, you should expect to bear all of the same costs when leasing that you would if you were buying the car unless otherwise stated. It should be noted that many auto manufacturers that use their own in-house leasing companies tend to either include most routine maintenance in the leasing contract or offer it at a discount as an option when you lease your vehicle. It is important to pay close attention to the maintenance clause of the leasing contract, as that can differ between manufacturers. Some leases will require you to have your car serviced exclusively at manufacturer dealerships, while others let you take your car wherever you want or even perform the maintenance yourself, as long as it is done properly and on time. Most leases also require you to hold a relatively high level of insurance for the car to cover it in case of accidents or other inadvertent events. A common misconception is that the dealership where you purchase your vehicle owns it for the duration of the lease. 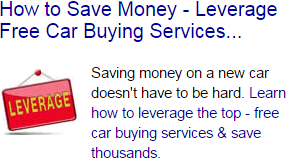 That is not the case; the dealership’s role is simply to sell the car. 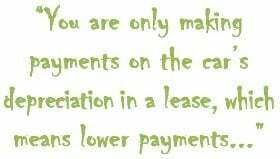 It makes little difference to them if they sell it to you directly or to the leasing company. That is something that may play an important role when the time comes to return your car at lease end, since the dealership may consider it more valuable as a trade-in than the leasing company values it. In the above section, you’ve already seen some of the major actors that are involved in the leasing process. 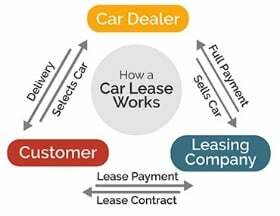 The three major players in any lease are the dealership that is selling the car, the leasing company that leases out the car and the customer - you - who is leasing the car. Each of the three actors have a very important role to play in the process, and interact in different ways with each other. The dealership, as already mentioned, serves the same role in a lease as they do when you opt for a traditional car loan. They are the ones that are selling the car, though in the case of a lease they sell it to the leasing company instead of selling it to you directly. 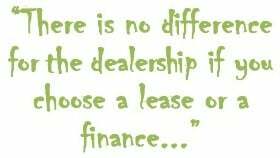 For the most part, there is no difference for the dealership if you choose a lease or a finance, but they may not be able to use the same manufacturer rebates, kickbacks or special offers for leases that they can for conventional financing or vice versa. For that reason, it can be very beneficial to search the internet for the different offers and incentives that are offered by the manufacturer of the car you want to buy. Otherwise, the dealership makes its money on a lease the same way they do from any car sale they make: from the difference between the car’s final sale price and the price at which the dealership buys the car from the manufacturer, which is also known as the invoice price. It is important to keep this fact in mind, as it means that it is possible to negotiate the price of a leased car in the same way you can negotiate the price of a car you are financing or purchasing outright. The leasing company serves the role of the lessor in a leasing arrangement. They are the entity that buys the car that it then leases to you, and they are the ones who end up owning the car after your lease ends and you return it to the dealer. 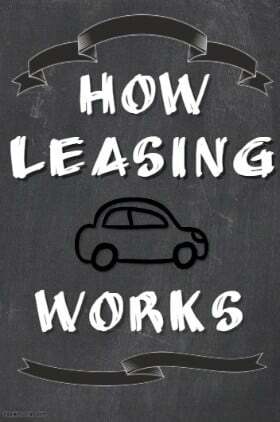 A leasing company is a financial institution at its core, with the car serving as an asset. Most leasing companies are either specialized divisions of major banks or are subsidiaries owned by the car manufacturer that serve to provide financing for people who are buying or leasing that manufacturer’s vehicles. The latter are called ‘captive lenders’, and often offer lower or more competitive rates, since they only exist to allow the parent company to make money. Independent leasing companies, on the other hand, have to make money off of the leasing agreements that they sign, so they may charge higher finance rates and disposition fees or set lower residual amounts on their leases. On the other hand, they often offer more options and can provide better rates to customers with particularly good credit. Some examples of captive leasing companies are Toyota Financial Services, Ford Motor Credit Company or American Honda Finance. Independent leasing companies include major banks such as Capital One or Wells Fargo, as well as branded subsidiaries. For example, Mazda Capital Services is actually a division of Chase, despite the name, while Chrysler-branded financing is actually provided by Santander Bank. This may seem very complicated, but often most dealerships only work with one or two leasing companies and pick the one that offers the better terms in order to make the sale. An easy way to compare different leasing options at a glance is to see what kind of deal offers are advertised online by the different manufacturers’ dealerships. This can give you a sense of the kind of leasing terms that the leasing company associated with that manufacturer or dealership can offer. The final piece of the leasing puzzle is the customer - you. As you are the person who is actually signing the leasing agreement, driving the car and making the payments on it, you are the most important part of the leasing process, and hold all the power in the negotiating process. In addition to the usual responsibilities of car ownership, your role for the duration of the lease is to keep the car you are leasing in good condition. That includes taking care of all of the regular scheduled maintenance on time, as well as performing any repairs that the car might need as a result of an accident and keeping it generally clean. Another common misconception about leasing is that it is simply a long-term rental. While these two kinds of contracts may have superficial similarities, under the hood they are very different in their nature. Car rentals, even long-term ones, are often limited to a much shorter term than a lease, which can last up to four years. Renting also tends to cost much more on a per-day basis than leasing a similar car would cost. There is also a key difference in what you are paying for. When you are renting a car, you are paying for using it. On the other hand, your lease payments are covering the depreciation of the asset - the car - that you are holding on to for the leasing company for two to four years, as well as the interest on that depreciation. Finally, at the end of the rental term, the car is always returned to the rental company. With a lease, on the other hand, you have several different options available to you, of which returning the car to the leasing company is merely one possibility. A car lease has a lot more in common with financing a car than it does with renting, but the two are still slightly different kinds of transactions. One key difference is the ownership of the car. When you finance a car, you are the car’s owner, with the finance company merely holding a lien on the title, which limits you from transferring the ownership of the car until you have paid off your loan. In a lease, on the other hand, it is the leasing company that is the owner of the car, with you merely having the right to drive it for the duration of the leasing period. When financing a car, you have to pay for the entire loan amount over the term of the loan, while you are only making payments on the car’s depreciation in a lease, which means lower payments most of the time. Practically, the most important difference is what happens at the end of the term. In a finance, you become a full owner of the vehicle, stop making payments and the lien on the car’s title is removed. In a lease, you have to return the car to the dealer at the end of the term and choose from one of the lease-end options, such as returning the car, buying it out or selling it to the dealership.